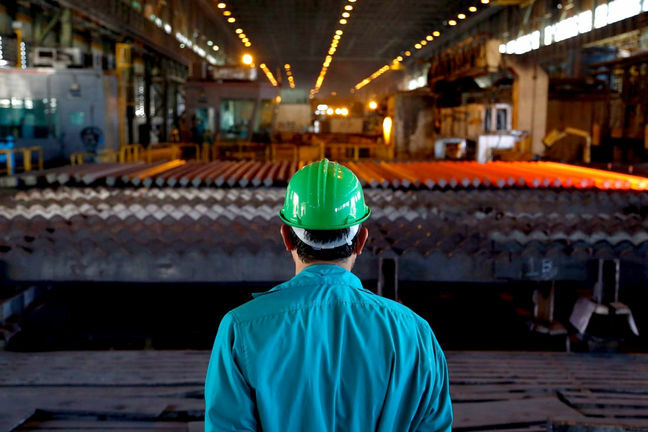 EghtesadOnline: Major Iranian steelmakers exported a total of 3.10 million tons of semi-finished and finished steel products during the first five months of the current fiscal year (March 21-Aug. 22) to register a 5% growth year-on-year, according to data released by Iranian Mines and Mining Industries Development and Renovation Organization. The steelmakers shipped 483,510 tons of steel during the fifth month of the year, Mordad (July 23-Aug. 22), which indicates a 24% YOY growth. The data used here are preliminary statistics offered by IMIDRO on Iran's top-scale producers and lacks details on most private producers' shipments. A more detailed report is usually published by Iran Steel Producers Association a few weeks later, according to Financial Tribune. Khouzestan Steel Company exported 1.11 million tons of slab, bloom and billet in the five-month period, registering a 5% decline YOY, to stay on top of the chart. Slab exports had the lion’s share of KSC exports with 530,096 tons, going up 70% YOY. Bloom exports came next with 299,533 tons down 51% YOY, followed by billet with 280,837 tons, up 16% YOY. KSC shipments for the month declined 36% to 151,458 tons. The company did not have any billet exports during the fifth month. Its bloom exports dropped 72% to 26,820 tons and slab jumped 380% to 124,638 tons. The steelmaker, located in the southwestern Khuzestan Province, exports to over a dozen countries. About half of the exports goes to the Middle East and North Africa region. Other major export destinations are located in the Far East and Americas. KSC exported a record high of 2.76 million tons last fiscal year (March 2017-18), growing 34% YOY. Mobarakeh Steel Company's shipments abroad amounted to 602,075 tons for the five-month period, up 65% YOY. Hot-rolled coil top the company’s exports with 315,057 tons, marking a rise of 172% YOY, followed by slab and bar with 263,006 tons (up 30%) and hot-rolled sheets with 15,773 tons (down 53%). MSC’s Mordad exports also went up by 91% to 142,462 tons. The company was last year's second largest exporter with 1.29 million tons of shipments. Together with its subsidiaries, Mobarakeh Steel Company is the largest flat producer in the Middle East and North Africa region, accounting for 1% of Iran’s GDP. Esfahan Steel Company’s exports totaled 463,076 tons during the five months to register a 21% decline year-on-year. The company’s rebar exports witnessed a 10% YOY increase of 10% to reach 87,102 tons. Beam exports amounted to 52,696 tons, up 6% YOY, while cast iron ingot exports reached 463,076 tons. The company’s exports during the month went down by 15% to 93,472 tons. ESCO ended last year with an 80% uptick in exports to 1.15 million tons, making it the third largest exporter. Hormozgan Steel Company came next with 373,549 tons of slab exports to post a 15% decline YOY during the five months. South Kaveh Steel Company took the next spot with 365,000 tons of billets to post a 23% YOY rise. Khorasan Steel Company was next with 75,189 tons of bloom and 32,256 tons of rebar. It was followed by Iran Alloy Steel Company with 32,220 tons of rebar and Khouzestan Oxin Steel Company with 13,340 tons of plates.